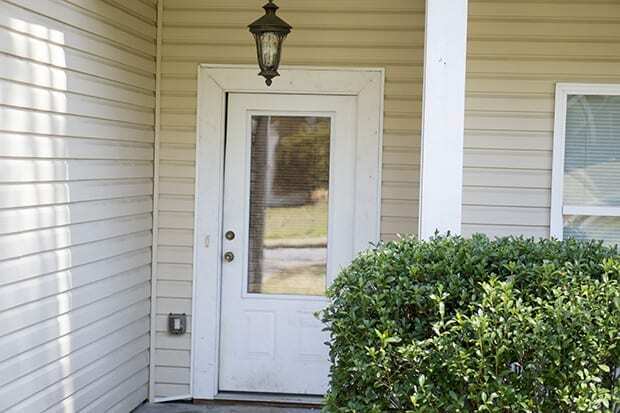 I’ve wanted to spruce up the house and give it more curb appeal for a while now. 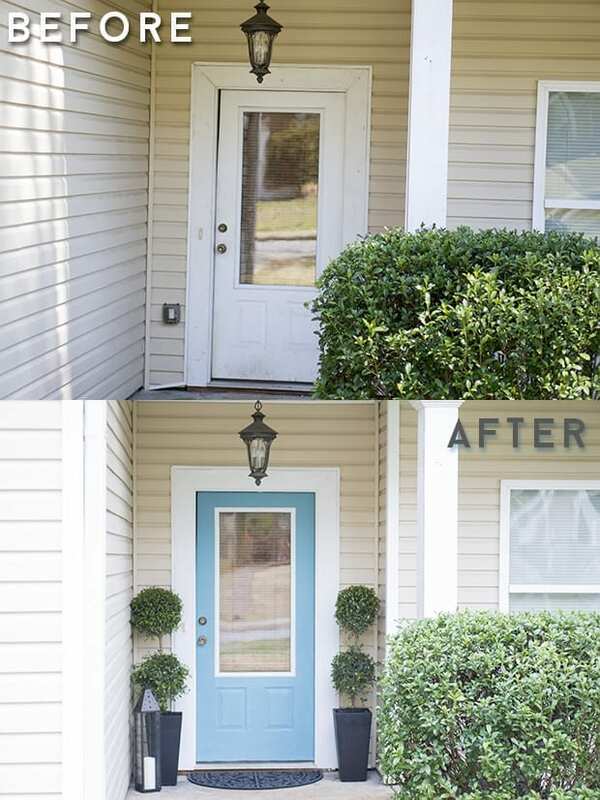 With Pinterest as my visual search engine, I went to work trying to find a color that I thought would look good with our beige siding and white trim. We have a Craftsman-style home, so a little flair is a good thing. One of my favorite colors is turquoise (even my hair is colored), and I kept stumbling on a pastel blue-turquoise color that worked with the other colors of the house. So I went for it. I stopped at my local Ace Hardware to get samples of some colors. 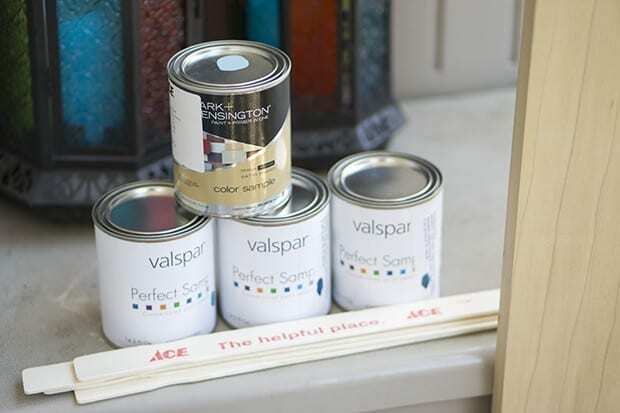 When I arrived, I opened one of the inspiration drawers in the Valspar display, and it was like the heavens opened up on Carolina Coast. It was THE perfect front-door color. When we first moved into our home almost eight years ago, my husband bought a 5-gallon bucket of the same color and painted every room in the house. At the time, it was what we needed to get moved in and settled, but now I’m dying for some color. I created a Pinterest board to gather some inspiration for some paint projects that I plan on trying over the coming months. I have another dresser to paint, along with some rooms in my house that need some changes and accent walls. My love for geometric patterns has me considering a fun accent wall in my bedroom this year. We’ve already tackled the kitchen and the downstairs bathroom with a washable finish, and now I’m excited to see what we think of next. I’ve already grabbed a handful of paint samples to get ideas for these future projects. 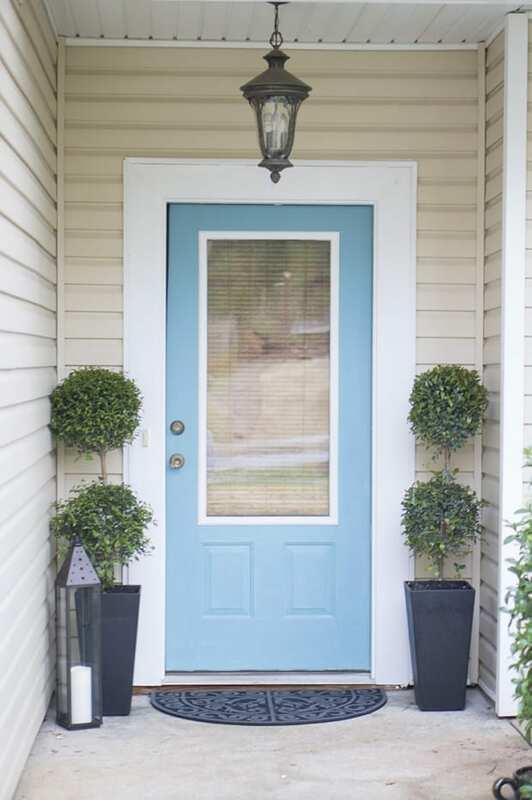 What I love about paint samples is that I can not only test out colors in my lighting and space, but I can also use them for smaller projects like painting the front door. I don’t need a lot—just enough to get a few coats on there, and that’s it. I have a shelf in my house filled with paint samples from over the years. I think I’m going to make a super awesome plaid print wall one day with all the colors I have. It will be my funky fun wall. I also gave the trim a beautiful new coat of paint to make sure that everything looks good. My husband plans on hitting the columns and other areas in the front too. 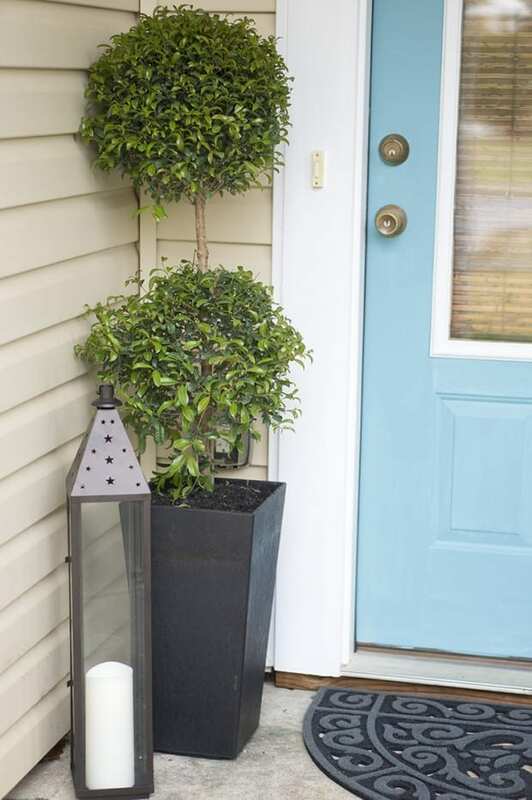 I added two new planters with some beautiful topiaries, and then I found an awesome tall lantern with stars on the top that I just had to have from my local store. I think the finished project came out well! I’m in love with my new door color, and everyone has been complimenting it as well. Looks great! I want a new door and a red one but I’m waiting until we redo the siding of our house first. Oh I bet red would look great too. I was also leaning towards a navy blue.